A strange sound burst into my ears this morning. A rustling of feathers and a twitching of grass - brushed twigs into the light wind. I peered out of my bedroom window and There! Was this huge black Raven. He’d raided the bird’s nest of the finches that live in my roof’s drainpipe. His large eye abruptly caught my steely gaze, then he buggered off as my hand went for my mobile-phone camera. Dammit! Would have made a great picture. French Legionnaires' patronizing a local pub, consorting on beer and women. I remember years ago I had a past like regression, to a previous existence. Apparently I’d been an Algerian Legionnaire who died in Indochina; I personally think it was my subconscious being teased. It’s amazing when you read the other stories of people who’ve had this procedure done on them. The hypnotist puts them in a trance and pow! You were a Pharaoh of Egypt, or a courtier to Elizabeth I. They never say, ‘Oh! Your name was joe, and you cleaned toilets in 1824 at Nottingham docks. Or you shovelled camel dung and horseshit in Egypt at the time of the Pharaohs.’ Not glamorous enough. I did feel sorry for the actor Peter Sellers, who used to consult psychics all the time. He lived his whole life on what they said. I definitely don’t! Noticed this on my travels. 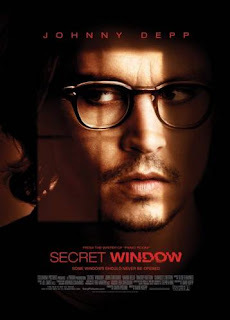 Last night I watched a film called: ’Secret Window’ based on the novel by the master, Stephen King, and starring Johnny Depp. I thought it was really good, and spooky. The ending was terrific, because it completely fooled me about why that person was harassing the author character in the film, played by Depp. I won’t say anymore in case you haven't seen it, but I certainly recommend a viewing to anyone with a spare night to kill. I've also finished reading Barbara Leaming's biography on Marilyn Monroe; it was an excellent read, very informative with lots of information. I'll have to get another biography about Marilyn - to see how they compare. Well, that’s all for now. By the way it's still freezing cold!